Crypto for care homes - really? Thought the crypto-currency and blockchain craze had faded away? In recent weeks, messages about all sorts of schemes involving creating new coins and exploiting the wondrous blockchain technology have popped into my inbox. The most bizarre of all was from a company planning to get residents of upmarket care homes to pay for their rooms using a new crypto-currency. Carlauren Group, which describes itself as the "UK's leading innovator" of care services, was creating what it called the C-Coin. In the email's next paragraph the excitement mounted: "This breakthrough blockchain technology will provide all residents at Carlauren's Lifestyle Resorts and Care Homes with a safe and secure currency, whilst also removing the worry that's associated with carrying cash". 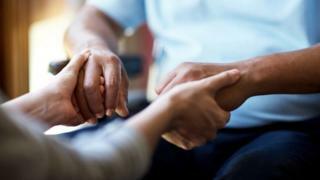 The scheme involves residents buying C-Coins for £70 each, the price of one night in a Carlauren care home or resort, separate from the costs of care. The company says the unusual thing about the coins is that it will always guarantee to buy them back at £63, so the risk of investing in any crypto-currency is largely avoided. This is painted as an innovative way of allowing well-off elderly people and their children to invest in their room for the long term - a kind of timeshare scheme which would then be tradable because the coins could be sold on an exchange. But for that intrinsic value to exist, the C-Coin has to be open to external investors through an Initial Coin Offering or ICO. Carlauren is issuing 500,000 coins raising £35m, although Mr Murray insists that his firm has no need to raise funds. There is a Carlauren Coins Exchange and a White Paper you can download full of purple prose about the wonders of blockchain technology - "arguably the largest technological revolution since the internet" - though with little detail about what role it plays here. We also learn that Carlauren was only founded in 2015 but is "now one of the UK's leading innovators of long-term residential later life and care services". This business does not, however, appear particularly lucrative. The very limited and unaudited accounts filed for Carlauren Group at Companies House show that it had net liabilities in 2017 of £610,475, up from £141,898 the previous year. The firm's chief financial officer, David Bruce, told me: "Carlauren Group has substantial assets under its control and it has an ambitious development programme aimed at delivering a high-end leisure and care service package to its residents. We are confident that this can be achieved with the resources at our disposal." The ICO White Paper does contain this warning: "The purchase of Carlauren coins may involve special risks that could lead to a loss of all or a substantial portion of the purchase amount. The purchase of Carlauren Coins is considered speculative in nature and it involves a high degree of risk." So that guarantee that coins will be bought back at £63 is not set in stone - if Carlauren goes bust, your coins will be worthless. When I headed to the Carlauren Coin Exchange I found that anyone can sign up to buy coins, with no apparent checks, so I decided to try it out. The exchange showed there had been just a handful of transactions so far and nearly all of the 500,000 coins were still available to buy at £70. Curiously, the exchange also listed a market price for the coin of £189. So with a couple of clicks I bought one coin for £70 and immediately sold it - or so I thought - for £189. The next day I found that while £70 had been debited from my bank account, the £189 had not arrived. When I looked at my account on the exchange my sale was listed as "pending" - presumably nobody is going to buy my coin off me at £189 when there are still 499,953 available at £70. "We want to let you know that someone has just bought 1 C-Coins at £70/1 C-Coin. "The current market price of one C-Coin is £189.0017/1 C-Coin. "There are still available a total of 499,955 C-Coins on market at price of £70/1 C-Coin. "Is time to buy or to sell?" Now this struck me as misleading, an invitation to buy C-Coins on the understanding that you might be able to sell at an instant profit. When I contacted Sean Murray he explained that this £189.0017 market price would only be available once all 500,000 coins had been sold. That price had been calculated using a formula I confess I did not fully understand, but he agreed that the wording on the exchange website needed to be clearer. I am well aware of how risky crypto-currency investment is, but are the elderly residents of care homes really ready to enter this world? I approached a number of regulators, from the Care Quality Commission to the Financial Conduct Authority for comment but they explained that as crypto-currencies are not regulated in the UK there was not much they could say. "Requiring care home residents to pay for goods or services in crypto-currency may raise potential consumer protection concerns." I went back to Sean Murray with a simple question - how would he defend the marketing of the Carlauren Coin to his residents? "I believe that the future of how transactions are made for goods is changing towards crypto-type transactions," he told me. "No-one likes change but we have to move with the times , our younger generation will become older and it takes visionaries such as myself to make these changes." Throughout our conversation, Sean Murray repeatedly referred to himself as a visionary, insisting I had underestimated just how innovative Carlauren's plans were. He says 1,500 people a week are getting in touch to inquire about membership so we will find out soon how many buy into his vision.